Carrier Vibrating Equipment offers a full line of after market parts for our vibrating feeders, conveyors, screeners, foundry equipment and more. The Aftermarket Sales Team is ready to answer your questions, determine what parts you need, and schedule shipments as required. Engineers are also available to assist in redesign or retrofit of your existing equipment for new applications. Orders are processed within 24 hours, with stock components guaranteed to ship within three working days. Many parts can be shipped the same day. Shipping arrangements, either by truck, rail, air, or water, are easily accommodated at the most economical routing possible. 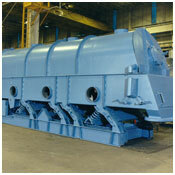 Provide quotations to supply fabricated replacement items, such as troughs, drilled decks, hoods, etc. to meet design requirements and specifications. Call our Aftermarket Sales Team, or e-mail us at ams@carriervibrating.com today! Always consult the parts list in your I/O Manual for the specific serial number of the machine. 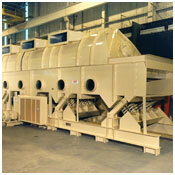 Carrier equipment is custom-designed and manufactured; no two units are exactly the same. The five-digit Carrier serial number can be found in the drive area, at the end of the drive shaft. It is also shown in the lower right-hand corner of the final certified drawings included with your I/O Manual. Guidelines for credit card or C.O.D. purchases are outlined in our order terms section. Component parts for Carrier vibrating equipment are precision engineered to perform specific functions and tested for use in our equipment. We recommend the use of only authorized Carrier parts. Carrier cannot warrant equipment using counterfeit components and parts not of Carrier design. Contact us today at 1-800-547-7278 or email your request to ams@carriervibrating.com.